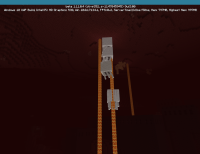 Once a ghast has randomly floated into a column of falling lava, it becomes stuck there for a long time (possibly permanently). It will move up very slightly but will not move horizontally at all. If it can be nudged out of contact with the lava, it resumes its normal wandering. 1. Go to the Nether and scout for a location having a large, open area with many columns of lava dropping from the Nether ceiling. 2. Wait for ghasts to spawn and watch for one that flies into a lava column. The ghast floats through the lava as if it weren't there. The ghast floats through the lava until it is just about to exit contact with it. It then stops making horizontal progress as if impaled, a slowly works its way up the column.